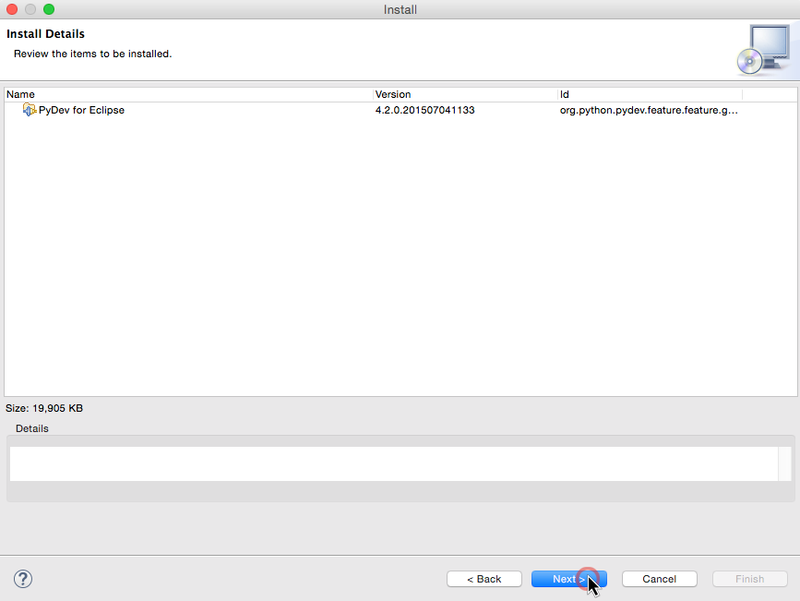 The version of Eclipse used in the recording of Python 3 Essential Training was Eclipse 3.5.2 (Galileo SR2) and the version of PyDev was 1.5.7. As of this writing, the current version of Eclipse is 4.5 (Mars) and the current version of PyDev is 4.2. 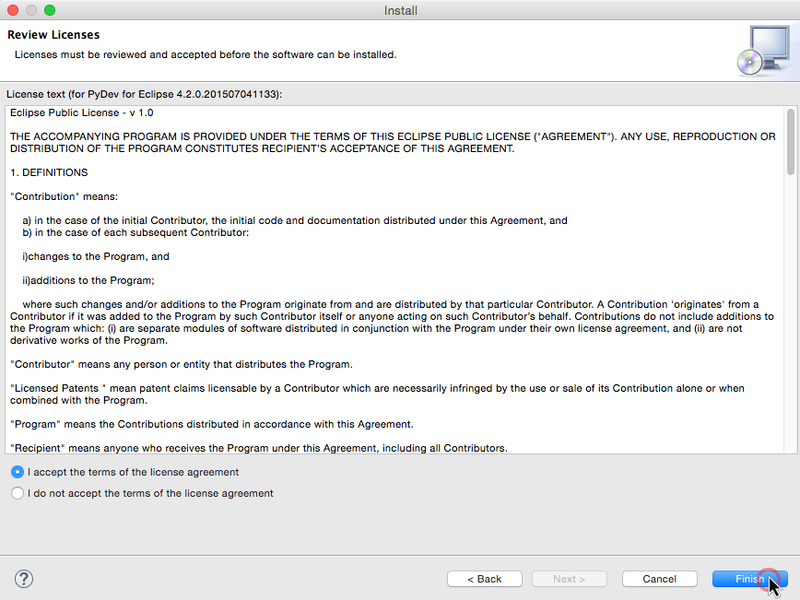 The procedure for installing Eclipse itself has not changed, but the process documented in the movie for installing PyDev may not work for 4.2. 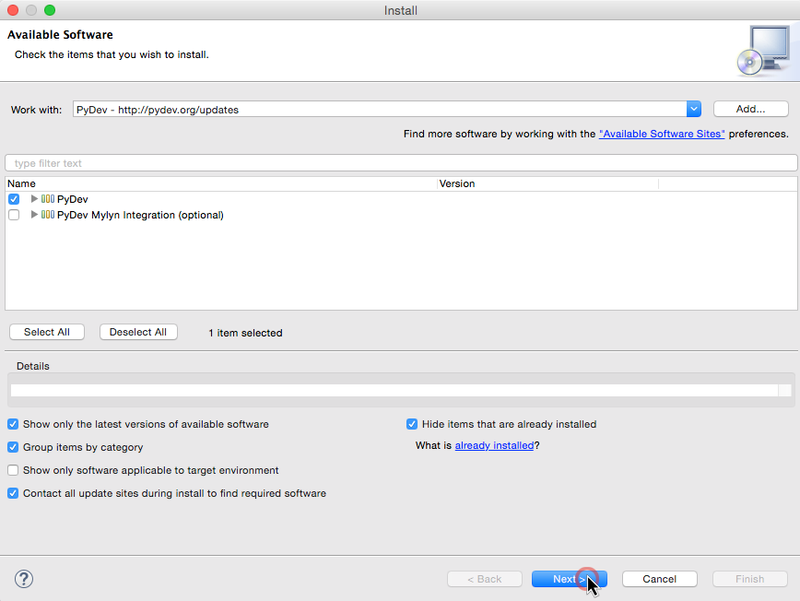 These instructions are for installing the latests PyDev with the latest Eclipse. After you have followed these instructions, please finish the installation using the instructions in the movie to configure PyDev for the course. You will need to install the current version of Eclipse. This should work just as it does in the installation movie. 2. Unzip the file using your operating system's unzip feature. On Windows-based systems this will be the "Program Files" folder. On Mac-based systems this will be the "Applications" folder. Eclipse will check for updates from various sources, depending on the installed options. Be patient. This may take some time. Under some conditions it could take up to an hour, depending on how many sites it needs to contact and how many of them are busy or down. 6. Select and run the updates. 7. After it's finished installing the updates, press Restart Now to restart Eclipse. The installation process for PyDev has changed subtly since the recording of Python 3 Essential Training. These instructions are meant to document this new process. After following these instructions, please continue with the video installation movie to configure PyDev for use before continuing with the rest of the course. Note: The screenshots in this document were taken using a Macintosh running OS X 10.10. If you are running Eclipse on Windows, these instructions should still be the same for you. The only differences are cosmetic. 1. Select Install New Software from the Help menu. 2. In the Available Software window, press the Add... button. 3. Enter the Name and Location for the PyDev software. Type "PyDev" for the Name. The URL "http://pydev.org/updates" goes in the Location field. 4. Back in the Available Software window, select the PyDev item by checking the box. Make sure that PyDev is the only selection that is checked. There should be no other selections checked and the message “1 item selected” should be present under the selection pane. Then press Next. 5. The Install Details window should show just the one item. Press Next to continue. 6. In the Review Licenses screen, press the button next to "I accept the terms ..." and then press Finish. 7. You will now see a progress bar as the software installs. This could take a while. 8. 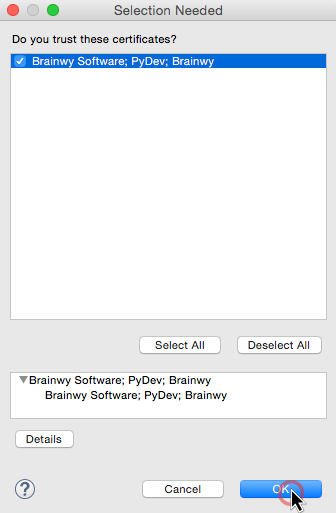 About halfway though, you will be asked to accept a certificate from Brainwy Software for Pydev. Check the box and press the OK button. 9. When the software is finished installing, you will need to restart Eclipse. Press the Restart Now button. 10. 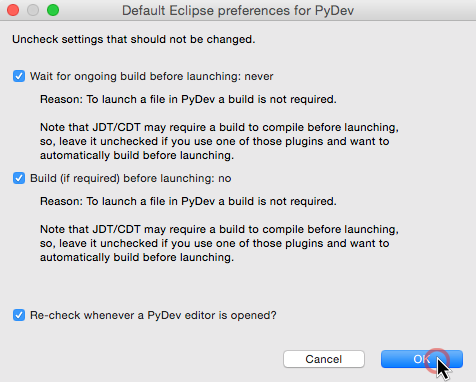 After restarting, you will see this Default Eclipse preferences for PyDev dialog box. Leave all the boxes checked and press OK. The installation is now complete. Please return to the installation movie to configure PyDev for use with this course. Famous Last Words #10: "Go ahead, I dare you." At BHG Worldwide Headquarters it is now eighteen till six, on Wednesday, 24 April 2019.